On Monday the Spanish IBEX35 gapped up as Catalan worries receded. 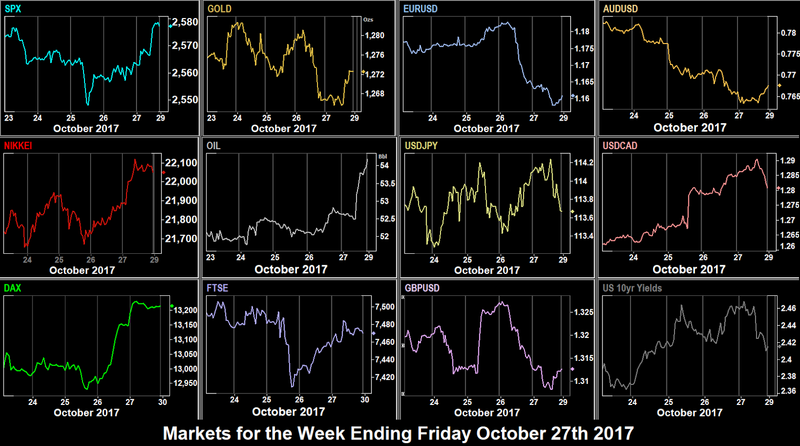 As we predicted last week, the markets were very quiet because of Columbus Day. SPX was slightly down (2 handles) and DAX and NKY were near-flat, the latter market being closed. FTSE gave up ground to rising GBP as the poor performance Conservative Party conference faded in traders’ minds. NDX managed to eke out an intraday all-time high, after gapping up, but ended the day down. The Chinese markets opened after a week, gapping up to a 21-month high. USD was generally flat against most currencies, only GBP showing any gain, and Gold and Oil advanced a little. The only interesting price/action of the day was USDTRY which rose 4.5% after a threat from the US to refuse all visas to Turkish citizens. US bond markets were closed. On Tuesday we were expecting two events, a North Korea missile which didn’t happen, and a Catalan declaration of independence, which did, but was immediately ’suspended’ by separatist President Puigdemont. The Spanish IBEX fell again, but this concern was not reflecting in Spanish 10-year bonds, or EUR, which was healthily up on the day. SPX made an intraday all-time high, as did NDX, and DJIA made another ATH close. NKY hit a 10-year high, and FTSE rose strongly (despite GBP strength) after a strong beat on Manufacturing Production, yet a miss on the UK Trade Balance. Only DAX was flat, despite the Trade Balance beat at 0600, probably reflecting Euro strength. USD had its worst day in a month, with DXY down 0.4%, all other currencies were up, as was Gold. Oil also surged 2.7% on reports of further Saudi cuts. Bond yields dipped with USD, ending the day 2bp down at 2.34%. Wednesday was another strong day for equities. SPX, DJIA and NDX all closed at all-time highs again, and DAX and NKY followed suit. FTSE pulled back slightly, and then started to recover but finished the day slightly down. The FOMC minutes, although outlining a ‘dot-plot’ of further rises, showed concern that inflation was not picking up. (September’s inflation print was 1.9%, but core PCE on Sep 29 was a miss at 1.3%, the inflation target is 2%). As we envisaged last week, USD fell, particularly against CAD, and to a lesser extended elsewhere, and despite an initial dip, to stay flat against JPY by the close. Bond prices (inverse to yields) and Gold were similarly up. Oil held on to the previous day’s gains, but did not advance any further. The API stock print (after the pit closes) was a day late due to Columbus Day, and came in as a miss at 3.09M (prev -4.08M). US equities took a breather on Thursday, but not before DJIA and NDX made another intraday ATH. Along with SPX they all closed slightly down. The euro broke its four-day winning streak which helped DAX beat the trend, at one point breaking 13000 for the first time, and closing up. The FTSE All World index made its third ATH in as many days. The UK FTSE 100 also made a record cash closing high at 7556, after a large spike which entirely reflected GBP, which was the main story of the day. Sterling had been fading since the European open, and then spiked down an instant 45 pips (0.33%) at 0943 after EU chief Brexit negotiator Michel Barnier said talks were “at deadlock”. However, this drop was fully recovered an hour later only for the fade to start again. However at exactly 1230, it then spiked up an immediate 47 pips to carry on rising during the US session. This is the normal time for main US economic releases, and many traders, including ourselves will have searched fruitlessly for some US data miss. There was none, the only releases at that time were beats on PPI and weekly jobless claims. It seems the recovery was based on positive remarks in the German Handelsblatt newspaper. Despite all this volatility, GBP actually posted an inside week. In other currencies, the DXY picture was deceptive. The basket rose 0.16% on the day, but this was entirely due to EUR coming off again, and to a small extend CAD which faded slightly as Oil unwound some of Tuesday’s gains, despite the EIA stock beat at 1500 (also a day later than usual). But Gold, JPY and AUD were up, and yields were down, as the FOMC inflation concerns continued to weigh. On Friday, the Fed’s concerns about inflation were strengthened. The CPI figure came in at 1230 as a miss (2.2% vs 2.3%) and the Core CPI at 1.7% (set 1.8%). Retail Sales MoM also missed, although the annual figure was as per estimate. DXY immediately fell 49 cents (0.53%), and USD fell on the day against all currencies except EUR. Gold was up, posting the first weekly green candle for five weeks, and bond yields fell sharply. As the day continued, USDCAD to end the day flat. Equities continued to blow out, with SPX, DJIA, NDX and DAX all making intraday and closing ATHs again, and NKY hitting a 20-year high. FTSE also rose but couldn’t quite match the previous day. Oil posted a slight gain. 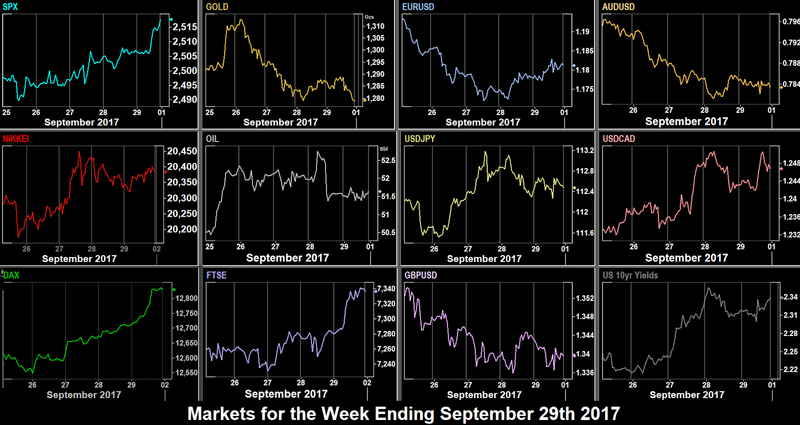 The summary of the week was a consistent rise in equities, and a consistent fall in USD, a pattern we have seen many times this year. These are the prices movements for the week on the instruments we cover. The dollar was down across the board, and best forex trade of the week would have been long AUDUSD at 2.06%. The strongest index movement was the NKY up 2.41%, surprising as USDJPY was down. 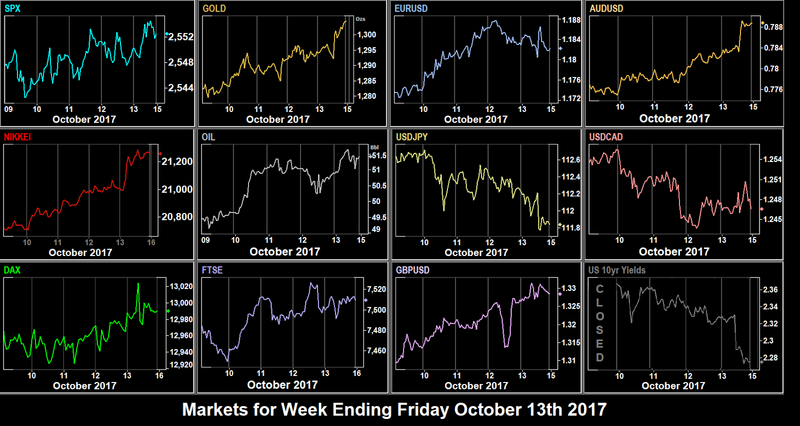 The largest overall movement was once again Oil, erasing last week’s losses to finish 4.56% up. Over the weekend the IMF meet in Washington and there will be speeches from Yellen, Carney and Kurd, amongst others. Also elections are being held in Austria, with eyes on the far-right FPO vote. They are new and neck for second place. Also New Zealand may announce the final coalition for the next government. The right-wing NZ First party is kingmaker here. Following on the heels of the IMF on Monday is a G30 meeting, also in Washington. Again Janet Yellen and BoJ Governor Kuroda speaks, along with PBoC Governor Zhou, and ECB member Constancio. The US House of Representative goes into recess, whilst the Senate returns. News releases include New Zealand CPI, the first of many this week, although no surprises are expected. Tuesday’s European session sees two more inflation prints, for UK and Eurozone. If the UK figure beats the 3.0% estimate, the case for a November GBP rate hike becomes very strong. Carney also gives testimony to the UK Parliament’s Treasury Committee, which will also be watched for rate hike pointers. Wednesday sees the minutes of the extraordinary EU Economic Summit, and the UK unemployment report. Traders may look beyond the headline figure for any indication of wage growth, the sticking point for rate increases. In China, the 19th Annual Communist Party Congress begins. Thursday brings the Australian jobs report. The estimate this month is 10k, well below the 54.2k last month. A beat is likely, but whether this helps AUD, given the previous clear RBA statement of not following the rest of the world, remains to be seen. Also important in the Asian session is China GDP. In Europe, focus is once again on the UK, with Retail Sales at 0830. Friday sees BoJ Kuroda speaking, but the focus of the day will be on Canada as inflation and retail sales are issued simultaneously as they were in the US last Friday. CPI is expected to increase from 0.1% to 0.3% and as we have seen in the past, CAD volatility usually follows. Janet Yellen speaks at the National Economists Club, but this is after the markets closed. The weekend sees elections in the Czech Republic. On Monday, as predicted, the Catalans voted for independence, and unsurprisingly EUR lost ground, as did the Spanish IBEX. Details emerged of more US tax cuts, and there was speculation that hawkish Kevin Warsh would be appointed to replace Fed Chair Janet Yellen. Also the important ISM Manufacturing PMI print was a beat. 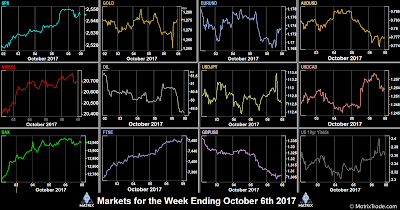 On the back of all this SPX, DAX, FTSE and NKY were all up, continuing the trend from last week and USD also rose against all other currencies. SPX, DJIA, and NDX all made new all-time highs. Gold was down as expected, but 10-year yields were however only 1bp up. Oil had a bad day, continuing its retreat from the previous week, and gave up 2% on the day. 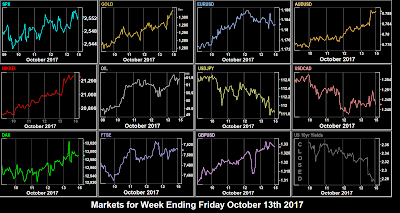 The momentum continued on Tuesday, which saw another record high for SPX, and DAX, FTSE, and NKY followed suit, the latter being particularly strong. The RBA rate decision at 0330 had little effect on AUD, and in general USD did a ’Turnaround Tuesday’ retreating to give up Monday’s gains against most currencies, Gold and bond values (inverse to yields) also gave up their Monday losses. The exception was GBP, which did not recover, on the UK PMI construction miss, concerns about UK PM May’s leadership and continuing Brexit worries. Oil continued to lose ground. The bull run continued on Wednesday, albeit at a slower pace. Nevertheless the DAX made a new all-time high, the first since Jun 21st. SPX also made its third record high of the week. FTSE was also up, and NKY was more or less flat after its strong run on Tuesday. The ADP jobs report, a precursor to NFP on Friday came in slightly ahead on estimates (135k vs 125k), but the estimate had been reduced, it was given as 135k last weekend as you may have seen in our report. Note that the effect of the recent hurricanes has made the figure less important this month.The Spanish IBEX fell heavily, losing 2.56% on the day on Catalonia concerns. USD was mixed, after Markit (1345) and ISM (1400) Services PMI beats, but concerns about the Fed Chair position, now another candidate Jerome Powell (slight dove, similar to Yellen) has emerged. EUR, AUD and GBP were flat, JPY was down (after a brief spike up) and bond yields were up, yet gold was also up. Oil faded slightly, after a brief spike up following the WTI EIA beat at 1430. Another day, another all-time high. On Thursday SPX, DJIA, NDX, RUT and even the Wilshire 5000 micro-cap index all hit all-time highs, as did DAX, despite the fade in EUR. Also posting all-time highs were the stock markets in Norway, Belgium, The Netherlands and Denmark. Even the Spanish market recovered the previous day’s losses. Analysts pointed to the progress in US tax reform as the main driver, although Trade Balance and Jobless Claim beats at 1230 also helped. In currencies, USD was also sharply up against all currencies, following hawkish remarks from Fed members Harker and Williams. Both supported another rate rise this year (ie on either Nov 1st or Dec 13th, CME FedWatch predicts the latter). Only JPY held its own, as it had already been rising during the Asian and European sessions. Yields of course were also up, although only 2bp, and Gold was down. Oil had a good day, recovering the previous two day’s losses. The exuberant mood changed on Friday for two reasons. There was talk of North Korea preparing to conduct another missile test (see our Next Week analysis below) and the NFP report was negative for the first time in seven years (-33k vs +90k est). SPX broke its seven day rising streak and fell on the day, as did DAX and NKY, although FTSE was slightly up on GBP weakness following political uncertainty after the lacklustre Conservative party conference, and disquiet about PM May’s leadership. Otherwise USD was weak, and fell against other currencies. The Canadian jobs report also missed estimate (10k vs 14.5k est) but this was less shocking, and CAD appreciated, ie USDCAD duly fell. The reaction from Gold and JPY was particularly interesting. These initially fell sharply on the jobs print, but then quickly (although not instantly) recovered to end the day up. Bond yields similarly spiked, but faded to end the day only slightly up. Oil fell sharply to end the week below the psychological $50 mark as fears of hurricane production cuts receded. There was Twitter chatter going into the weekend that North Korea might attempt another missile launch soon, and the Catalan situation in Spain is still unresolved. The New Zealand electoral commission declares the official result of the Sep 23 election. Coalition talks can now start. Similarly, the German CDU/CSU party hold strategy talks to determine their preferred coalition. Monday sees the Chinese (and Korean) markets open after a week’s holiday. It is Columbus Day in the US, but unlike the bond markets, the US stock market is open. However, activity is expected be greatly reduced, and in the absence of any US data releases, a quiet day is expected. Also the Japanese and Canadian markets are closed for Health-Sports Day and Canadian Thanksgiving respectively. Tuesday is the anniversary of the founding of the North Korea Bureau of the Communist Party in 1945, and as such, the chances of a missile launch on this day are higher. As we have seen before, no launch could result on a relief rally. Also the Catalan parliament are planning to make a unilateral declaration of independence. FOMC dove Kashkari speaks as the US session opens. There are quite a few releases, but nothing particularly important. Wednesday is the big day this week, with the FOMC minutes. The next rate decision is in November and the CME FedWatch tool is suggesting a 98.5% chance of a hold. Rhetoric has been hawkish recently, and a failure by Chair Yellen to continue this line could cause USD to falter. Fed Dallas President Robert Kaplan is of course speaking earlier (5pm PDT Tuesday in the US), and he is viewed to be slightly dovish, on the same page as Yellen. We will be publishing our non-rate decision fractals for subscribers. Thursday is packed with low-level data, but the key event of the day is a panel discussion in Washington when ECB President Draghi and Fed dove Lael Brainard both speak at a panel in Washington. The headlines are published at 1415, when the US and European sessions are both open. Markets are closed today in Israel and Brazil. Friday is the second big day, where we see US Retail Sales, followed an hour later by US inflation. The 2% Fed’s [tightening] target figure has not been hit since May. This month’s estimate predicts we return upwards. A beat would surely strengthen the beleaguered US dollar. After the prints, we see various speeches by Fed members as the day goes on. Monday saw a reaction to Angela Merkel being re-elected in Germany with a reduced share of the vote, and emergence for the first time of the far-right AfD party in the Bundestag. Aided by the IFO Sentiment miss at 0800, DAX fell and so did EUR, SPX and NKY also dipped but recovered somewhat in the US session. Notably the Spanish IBEX was down 0.9% on worries about the forthcoming Catalunya election. In currencies NZD joined EUR in reacting to the unclear NZ election result, falling 1%.. In any event, USD was up in general against most currencies. The exceptions were JPY and Gold, which were up as you would expect in risk-off sentiment, fuelled by further North Korea sable-rattling. 10-year T-Bill yields were down. The exception to the trend was oil, which was sharply up by nearly 4% after Turkey threatened to shut down the pipeline from Kurdish territories. 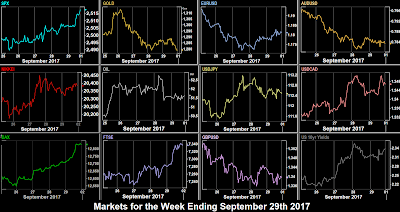 Tuesday saw DAX and NKY recover Monday’s losses, the latter largely responding to yen weakness, as “missile fatigue” once again set in. SPX was flat on the day and FTSE faded slightly. The IBEX fell again, and it was Turnaround Tuesday for Gold which gave up Monday’s gains. As Fed Chair Yellen hawkishly cautioned against waiting too long to raise rates again, USD continued it’ advance against all currencies except CAD which also turned around Monday’s losses despite Oil being flat. Yields rose accordingly. Wednesday saw Trump confirm his tax reform plans. 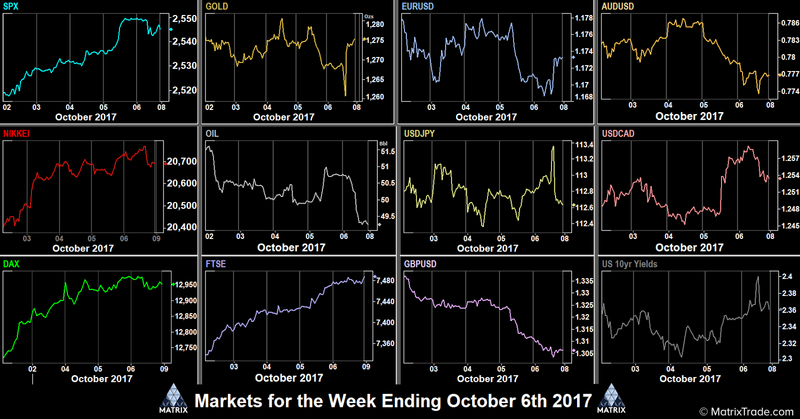 The details had already been released, but nevertheless all indices resume their upward path, particularly NKY as JPY extended its losses. USDJPY hit a 2-month high, Gold continued to fall to close at $1,281, the lowest level for a month, and SPX made another intraday all-time high. 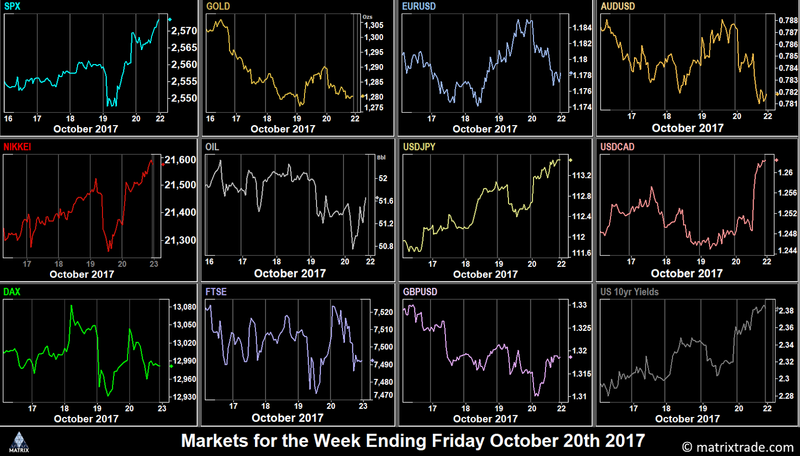 The dollar was up against all other currencies after the tax plans and Tuesday’s Yellen statement, and yields followed. The strongest move was against CAD, which fell 128 pips (1.04%) as Governor Poloz said that there was ‘no predetermined path for for interest rates’ in Canada, and the BoC will proceed ‘cautiously’ on rate hikes. The RBNZ rate decision (1.75% hold) had little effect, and did the WTI stock beat, as oil remained flat. On Thursday FTSE was fairly flat, but DAX rose very gently all day after the German Gfk Confidence miss (0600) was followed by the various Eurozone Sentiment/Confidence beats (0900). SPX also hardly moved, but after the GDP beat (3.1% vs 3.0%) at 1230, it did manage to close at a new ATH of 2510. NKY on the other hand faded almost tick for tick with USDJPY decline. The story was different for USD, which gave up some of the gains earlier in the week. 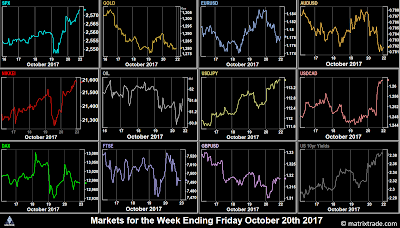 It was down against all currencies, as were yields, and Gold was up, as the market digested the Trump tax plans and wondered whether they would get through Congress. Oil had a volatile day, up 1.62% at one point, but finishing the day 0.85% down. 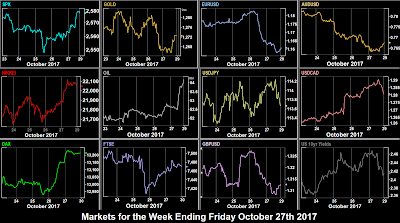 As the week, month and quarter drew to a close, equities rallied hard on Friday, with SPX at another all time high, and the other indices closed at highs of the day. EUR was also up again, back to where it was on Tuesday, despite the Eurozone inflation miss. However, other currencies fell against the dollar and despite EUR, DXY finished the month with its first green monthly candle since February. A surprise news item was that Trump had met former Fed Governor Kevin Warsh as a possible replacement for Chair Yellen. Warsh was on the Fed during the 2008 crisis, and is considered to be more hawkish than Yellen. Bond yields moved up sharply on the announcement, putting on 4.3bp in an hour, the same kind of move we saw at last week’s FOMC. Gold gave up Thursday’s gains, and Oil was flat on the day. These are the prices movements for the week on the instruments we cover. The best forex trade of the week would have been short AUDUSD at 1.72%. The strongest index movement was again NIFTY at 1.74% as it continues to unwind gains earlier in the year. Over the weekend we have the controversial Catalan independence election on Sunday. As we said in our subscriber email this week, the markets are not really taking much account of this, although a yes vote now seems very likely — although Madrid will ignore it. The British Conservative (government) party conference starts in Manchester, UK and runs until Wednesday. Surprises are unlikely on the first day. The Chinese (including Hong Kong) markets are closed all week for the National Day Golden Week. South Korea’s KOSPI also closed all week for the Chuseok (Harvest Festival). Note this is celebrated in Pyongyang as well, possibly indicating a pause in the war of words. The pause gives a good indication of Chinese trading activity, by its absence, for example, will Bitcoin volatility reduce? It is also of course NFP week. Monday sees the start of a new week, month and quarter. NIFTY is closed due to the Mahatma Gandhi Jayanti holiday. The day sees Markit Manufacturing PMIs for most countries we cover, but the more significant one is from the US Institute for Supply Management at 1400. Tuesday’s Asian session sees the RBA rate decision. No large volatility is expected. Traders will be looking for further reference to whether Australia takes account of the global hawkish trend to tightening, or not. The DAX is closed for German Unity Day, so the European open is unlikely to be volatile, especially as there is little news. Of course EUR, which is traded mainly from London, not Frankfurt will still be active and may react to the PPI print at 1000. Wednesday is another light day, with less important Markit Services PMIs following Monday’s manufacturing figures. PMIs are a survey of production levels, new orders, inventories and so on, and are much more meaningful for businesses which supply goods rather than services. Note that PMI surveys do not include prices (inflation), nor do they include sentiment. These factors are reported in separate releases. The main news of the day (short of Janet Yellen saying something new) is the ADP jobs report, which as you know, is an indicator for NFP on Friday. This month’s estimate is far lower than last month, although considerably higher at 135k than the NFP estimate of 98k. Thursday’s main release is the ECB MPC accounts (i.e. minutes) with a raft of ECB speakers on the day, Praet at 0915, Liikanen and Jazbec at 0930 and Coeure at 1315. Look out for talk about the strength of EUR, any concerns about this can only push it down. The central bank theme continues with Powell, Williams, Harker and George all speaking during the US day. Both the US and Canada report Trade Balances at the same time, a possibly volatility spot for USDCAD. As an aside, markets are closed in Portugal. Following on from that US/Canada theme, Friday is of course double NFP day, when both sides of the 49th parallel report at the same time. The US estimate is unambitious, being only two-thirds of last month, as is Canada’s at 15k (22k prev). Again, if one country beats and the other one missed, USDCAD volatility will resume. The reason for the lower US figure is the hurricanes, which of course have not touched Canada. CAD upside is therefore a distinct possibility. There is a three-day weekend for Japan as Mon Oct 9th is Taiiku no hi, the health-sports holiday. Also in the US Monday 9th is Columbus Day, where the bond (but not stock) markets are closed.